Before you hold your AK over your head and shout, "WOLVERINES," be sure that you have the ammo to back up your bark. 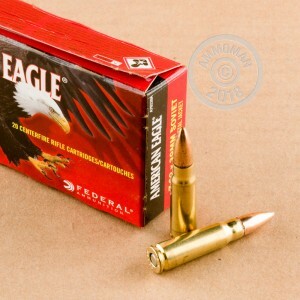 This bulk case of 7.62x39mm ammo comes with plenty of bite by way of top-tier components from Federal's own specifications. As brass-cased cartridges, these rounds will be ready to hit the deprimer, tumbler, and progressive reloading press after they are fired. Federal equips each round with a non-corrosive Boxer primer that won't eat away at your barrel and internal parts, allowing for more shooting between cleanings. A treatment of baby blue primer sealant prevents moisture from ruining dependable function. 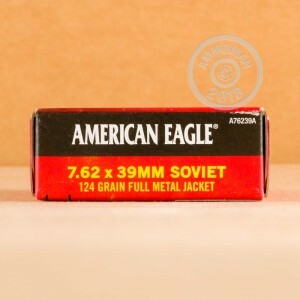 A 124-grain FMJ (full metal jacket) projectile tops this cartridge and is usable against any steel, paper, or cardboard target both in indoor and outdoor settings. A true copper jacket and lead-core prevent bullet trap penetration and sparking which is frowned upon by range owners. The projectile's medium weight of 124 grains, combined with a moderate powder charge, produces moderate recoil for training and a ballistic trajectory that matches plenty of other training loads as well as hunting and self-defense choices.